Two Amsterdam canals cross here: the Brouwersgracht and the Prinsengracht. The Groenburgwal canal, with the Zuiderkerk church. Amsterdam is famous for its many canals. The main canals form concentric semicircles, against the IJ river. Alongside the canal are thousands of monumental buildings. 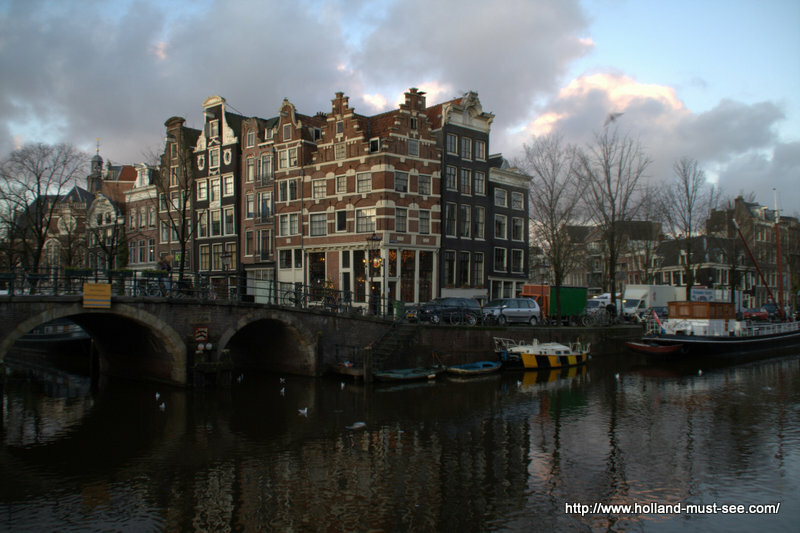 The main canals are the Heerengracht, the Keizersgracht and the Prinsengracht. 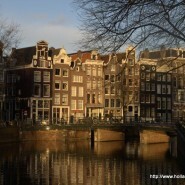 Look at the photo of the Prinsengracht, above, at the beautiful bridge, and at the beautiful canal houses on the bank. There are hundreds of these typical Amsterdam canal houses – can you imagine? The canals were dug for several reasons. One of them is defense of the city: The innermost canal, the Singel canal, was originally a moat around medieval Amsterdam. Another major reason is water management (keeping our feet dry). But the main reason for the canals is transportation – for many centuries, nearly all transportation in Holland took place over water. The best way to enjoy the canals is by boat: Take a canal cruise. There are many cruise companies, you will find several near Central Station or along the Damrak street. You can buy your tickets on the quay. Most companies also let you book in advance, often slightly cheaper. Most boats have (recorded) commentary or audio-guides in English, German, and Dutch, and sometimes more languages. Cruises run the whole year (except in extreme weather). Another good way to enjoy the canals is by foot: Just walk along the canals. You can buy maps and routes from the tourist information office (also known as VVV), near Central Station. The main canals are in downtown Amsterdam and can easily be reached by foot from Central Station.